It was the driest year on record for the Sierra Nevada, the second successive drought year, with less than 40% of normal precipitation. June is normally a cool and beautiful month in the park, and this June started as no exception. The abnormally heavy May rains had filled the meadows with deceptively large amounts of water, but most of the snow in the high country was missing and its melt water, life blood of the meadows, would soon drain away. By the second week in June, the temperature had climbed to that of August, and as the month wore on, park residents, visitors, and animals sensed a subtle change in the air. The air was not only warm but becoming humid as well. Water vapor in the air is a hopeful sign; it is the raw material of clouds — a byproduct of which would be welcome rain, but the cold air necessary to produce snow was held in check by a great mountain of air to the north and another even larger high pressure area to the west — the great Pacific High (Fig. 1, #I). The cold air could not move south from Canada. All storm fronts were being held and forced northward. The Pacific High dominated the weather charts as the Himalayas dominate Asia, and to the air, it was just as formidable a barrier as mountains are to man. By the second week of June the mornings dawned clear and warm, but as the day progressed clouds appeared above the summit of the Sierra. By 3:00 p.m. the summits of the range disappeared from view at Glacier Point, and flashes of lightning and thunder claps treated the visitors at the Point to one of nature’s most magnificent shows. By evening the clouds were disappearing and by 9:00 p m. the sky was clear again and the summer stars shown clear through freshly-washed air. As the month drew to a close, clouds began to appear earlier in the day, became larger in the afternoon, and to stay longer into the evening. Forces in the great atmospheric engine of the earth, which make man’s machines insignificant by comparison, were slowly, invisibly, and inevitably becoming more and more out of balance. Although invisible, these forces are measurable by products of man’s ingenuity. On June 27, the weather maps showed an area of low pressure to the east and south of the Sierra. The area over Las Vegas had become heated by the desert sun and air, warmed in’turn, and forced to rise as a hot air balloon (Fig. 1, #II). Into this vacuum, air tried to move but did so only at the surface. The source of this moving air was the Pacific High, but as this air moved across the vast Pacific Ocean, it evaporated water from the sea and as the air continued in its journey to the south and west, it faced the mighty heights of the Sierra, and as miners and native Americans before it, the air had to climb the mountains to reach the other side. As man must obey the laws of nature, so must air. Although some of the air’s moisture had been left behind in the California Coast range to produce the drip fog so necessary to the coast redwoods (Sequoia Sempervirens) (Fig. 1, #III), the majority of the moisture remained. The air crossed the heated central valley of California by night (Fig. 1, #IV). The lower 2,000' of moisture was removed by the coast mountains. The now drier air moved unnoticed past the grape vineyards, almond orchards and ripening vegetables of the central valley. It was dawn Tuesday, 28 July 1977. SCATTERED AFTERNOON AND EVENING THUNDERSTORMS. The forecast was like those of the previous days and caused no particular reason for concern, for thundershowers had been the rule each afternoon for almost two weeks. What was to happen today was not a question of the accuracy of a forecast, merely one of severity. Any prediction is only as good as the availability of data to use in its preparation. The atmosphere is a three dimensional entity, constantly changing, challenging man to measure its fickle nature. That morning the clouds formed a little earlier than usual. The ranger naturalist on duty at Glacier Point noticed that the humidity was also high. By 10:00 a.m. visitors to the Point were spending more time engaging the magnificent view from the shade of the trees and less time was spent at the railing in the sun’s full light. The people, dressed in shorts and light clothing, some with large brimmed hats, looked more like a beach crowd than visitors to a pine and fir forest at 7,000' above sea level. To the mid-westerner or easterner visiting the Point, the day seemed quite like home. The temperature had risen into the high 70’s and the humidity well above the 50% mark. But the view was quite different than that of “home” for nowhere east of the Rockies could one look upward to land 6,000' above while standing 7,000' over the level of the sea. 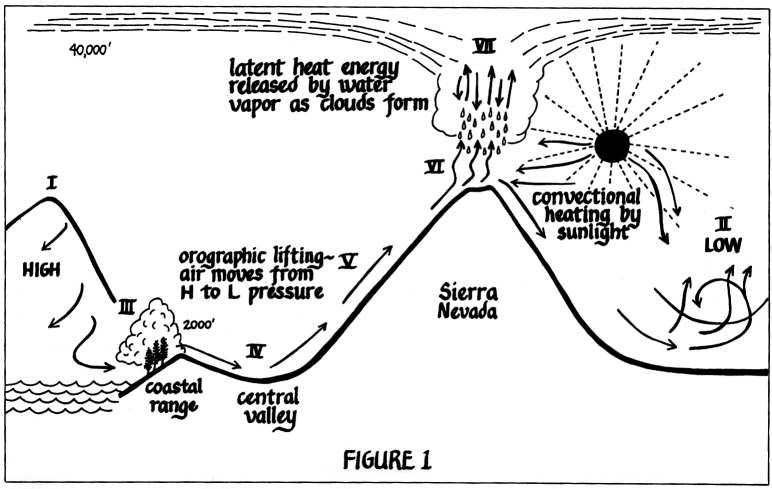 By 2:00 p.m. the rocks of the Sierra had reached their highest temperatures of the day. All morning, the air, which such a short time ago had been brushed by the waves of the sea, had been forced to rise up the great body of the Sierra as if being drawn by invisible ropes of low pressure to the east (Fig. 1, #V). Now, the same air was also being lifted by the hotter and less dense air rising from the rocks like heat rises from a stove (V). The meteorologist would say that the orographic effect of the mountains was being enhanced by the convectional heating of the Sierra Granites. Rising air expands while going up because the weight of the air over it lessens. Whenever a gas expands it cools. Cool air cannot hold as much moisture (in the form of a gas-water vapor) as can warmer air — and today’s air was holding a lot of moisture. The winds are the transportation network of the atmosphere and the passenger is water vapor. Contained in each gram of water vapor are 580 calories of heat energy — almost six times as much energy as required to bring water to a boil from freezing. Whenever one gram of water vapor (a colorless, odorless gas) turns into water liquid (visible as a part of a cloud) this energy, latent since the air left the sea, is released into the air. The energy released warms the air, and the air, now thus warmed, will add to the rising force pulling up air from below which in turn will release its energy and, like a great mushroom, the cloud thus formed will rise to heights dwarfing even the mighty Sierra (Fig. 1, #VII). The more water vapor in the air, the greater latent heat energy. Today, all conditions were correct within a small region of the Sierra Nevada to concentrate their energies into a single and singularly monstrous cloud. By 3:30 p.m. the view from Glacier Point was awe-inspiring. The towering masses of granite were playing only a secondary role in the scene. The clouds, with their bases at 9,000' and tops above 30,000' now became one in the east. To the west the sun was still shining. Half Dome was radiant with a black-grey background. The top of the cloud became visible due to its size, rather as an ant cannot see the head of a man when the man stands directly above it. Within the cloud, the energy equal to several atomic bombs is being released. Drops of water are freezing and throwing off tiny pieces of positively charged ice balls which gave them birth. The difference in electrical pressure builds until over 10,000 volts per centimeter are attained over great distances. The pressure becomes unbearable for the moist air and is released. In less than a second about 30 million volts at 100,000 amperes of energy heats the air to 10,000�C — the lightning flashes, the air expands to thunder and reverberates along the canyon walls. Visitors at the point stare at the point. Over 100 people stand transfixed by the sight. The time is 3:45 p.m. Within the cloud, billions of tiny ice crystals are attracting water vapor at the expense of water droplets. Some droplets are colliding with each other randomly, and still others, larger than their kindred are “falling” into their smaller brothers or drawing them into their wake. Great up-drafts are carrying millions of gallons of water into the cloud and drawing still more moisture-laden air upward to become a part of it. Finally, the size of the drops and ice particles become too large to be held up by the air and they start to fall. Most will fall at about 750'/minute, some of the larger ones over 1,000'/minute. From Glacier Point the bottom of the cloud seems to erupt, and the whole Merced River drainage above Nevada Fall disappears, enveloped as by a grey curtain; 12,000' high mountains vanish. One cannot see 100 yards into the deluge. The ranger seeing this spectacle encourages the visitors to photograph the scene. “If you ever wanted to take a picture of rain falling from a cloud, this is your chance.” Shutters click and are drowned out by another clap of thunder. Everyone in the area is spellbound, yet the sun still shines at Glacier Point. Slowly, almost imperceptibly the cloud moves northward towards Clouds Rest, the divide between the Merced River drainage, and the narrow glacial canyon of Tenaya Creek. Rain falls on Half Dome, Clouds Rest completely disappears, not in the cloud, but in the rain. So much water falls on Half Dome that water begins to steak down its massive flanks into cracks, along dikes, the mountain seems to develop a head of white hair as one watches. Thousands of gallons of white water in hundreds of channels flow down to Yosemite Valley. All of Tenaya Canyon disappears from view. A magnificent rainbow forms stretching from Curry Village to Sierra Point. Everyone at Glacier Point looks at the spectacle. The silence of the people is almost as deafening as the thunder. The sun continues to shine on Glacier Point. 4:00 p.m. The cloudburst moves from Clouds Rest toward Mt. Hoffman. When Clouds Rest becomes visible the enormity of the storm becomes apparent. In every possible path on the huge mass of granite, water, not in rivulets, but in torrents descends toward Tenaya Creek. The top of Clouds Rest, covered with white hail and snow give testament that rain began as ice pellets and melted as it plummeted to the earth below. Clouds Rest is white on top from snow and below the 8,000' level from water, sliding, free-falling, pushing, lubricating, washing, turning soil to mud; moving more earth in five minutes than a hydraulic gold mine in a day. 4:05 p.m. — At Glacier Point the visitors are marveling at the scene as lightning now brings its full fury to Mt. Hoffman. The ranger turns and runs to the telephone, for surely with this much water pouring into so narrow a canyon as Tenaya, the creek will overflow its banks. The people in Yosemite Valley could not see beyond Half Dome and may not even know of the severity of the storm over Clouds Rest. If ever Tenaya Canyon was flash-flooded this would be such a day. And it was. Hikers on the Tenaya Trail switch backs, ran for cover. Most said that they could not see the storm coming until it was upon them. Many escaped with only a few bruises. Two did not. Mudslides and the flash flood took two lives shortly after 4:00 p.m. above Mirror Lake. Tenaya Creek roared into Mirror Lake like a runaway express train. Almost all of the sand bar marking the most recent filling of the lake disappeared within ten minutes. But the presence of the lake saved further damage and possible loss of life down-stream, for the energy of the running water was dissipated by the lake. Within one-half hour after the ranger made his call, sandbars in the Merced River which had been above water for weeks were covered by rising water. By 5:00 p.m. — the storm was over. By the evening of the 29th, water in the Merced River and Tenaya Creek was receding rapidly. Within a week virtually all evidence of the flood of ’77 was gone. All of this happened, and the sun never stopped shining at Glacier Point or Yosemite Valley, and no record of the amount of precipitation is available since there were no rain gauges in the area. It is hard to believe that the flood occurred at all, especially on the driest year of record.